I'm sure many of you will have seen camera traps used on TV to monitor wildlife activity when the scientists or camera crews are not around. I have been using one of these cameras around the farm for some time now and find it invaluable for gaining an insight into life after dark and for generally monitoring activity of the wildlife on the farm. 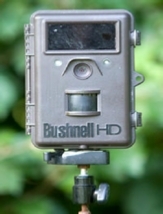 This camera effectively gives me an extra pair of eyes and ears and has recently revealed a little owl feeding at the hedgehog feeding site. Previously I have only ever seen one little owl on the farm and that was around 3 years ago. Thanks to the camera I now know that the current owl is a regular visitor and I am hoping to encourage it to stay and maybe breed. Looks like my meal worm bill will be increasing now! I have now added some of these clips to the website to share with you a little of the fascinating wildlife which lives here in my small patch of Norfolk.